Seventh grade isn’t so easy when you’re a little geeky, have a silent ‘S’ in your name, and you have to move because your dad just lost his job. Georges – named after Georges Seurat – is having a bit of a tough time, really. To make things worse, his nurse mother started taking double shifts after his father lost his job and Georges never sees her as she’s always at the hospital. The one bright spot in Georges life is Safer, a boy his age who lives in Georges’s new building. The two of them met after Georges attends a meeting of the Spy Club, which he sees advertised on a flyer in the laundry room on the day he moves in. Safer takes pride in teaching Georges the ways of the spy: watching the lobby cam for hours, determining whether someone has left the apartment by putting a gum wrapper in the door. Before long, however, Safer becomes an increasingly demanding spymaster to the point where he is making Georges uncomfortable. How much can – or should – Georges put up with in the name of friendship? Rebecca Stead won the Newbery Medal for her previous book, When You Reach Me. Liar & Spy has a very different, more realistic feel, but like When You Reach Me it is extremely well-written and absorbing. Georges makes the transition from character in a book to real, somewhat sad seventh grader extremely quickly. Your heart just goes out to him as he’s clearly having a very difficult time both at school and with his family situation. Liar & Spy is a wonderful, realistic middle grades novel that can also appeal to young adult and adult readers that will keep you wondering just exactly who is the liar, and about what? My daughter didn’t like Liar & Spy as much as When You Reach Me, but I’m going to check it out anyway. Did your daughter like that little fantasy twist in WHEN YOU REACH ME? She doesn’t go that direction with this one, so maybe that’s why? I really enjoyed this book; it made me very interested in giving Stead’s previous work a try as I think I’ll like it a lot. My friend Courtney of Abducted By Books just posted her experience meeting Rebecca and David Leviathan in Texas. It’s really made me want to read some of Rebecca’s books! 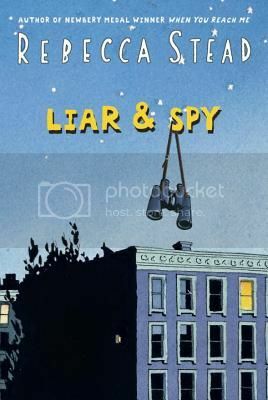 I’ve heard a lot of good things about Liar and Spy, so I’ll be on the lookout for it. I’ve read another positive review of this book that’s made me curious about it. Will have to check it out for my kids.